Bumrah might not have missed the extended hands from the gatekeeper but the fans didn't. Jasprit Bumrah will be once again spearheading the pace attack for the Mumbai Indians in the upcoming season of the Indian Premier League (IPL). The ace pacer is in fine form and is expected to play a key role for the team as the three-time champions look to bounce back after failing to make it to the playoffs last season. The Mumbai-based franchise had managed to win just six games last year and finished at the fifth spot. Bumrah has been in sensational form across formats in the last year or so and the Mumbai-based franchise will be keen to see him at his best in this season. And if the latest video posted by Mumbai Indians on their Twitter handle is anything to go by then one can say that Bumrah is looking ready to blow away oppositions with his deadly yorkers. In the video, Bumrah could be seen uprooting a single stump on a consistent basis with his fast and accurate yorkers. However, the fast bowler was all over the internet not for his yorkers in the video but for another incident that the fans managed to notice. 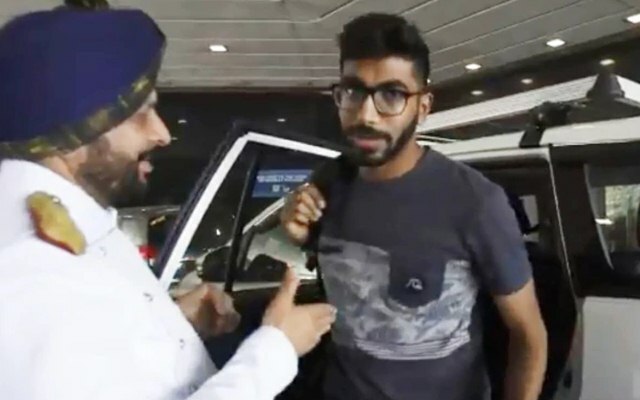 In the clip, Jasprit Bumrah could be seen stepping down from a car as a gatekeeper welcomes the bowler with folded hands (Namaskar gesture). The cricketer nods his head in acknowledgement but as he looks up to say ‘hi’ to the camera, Bumrah missed to shake hands with the gatekeeper who had extended his hand for the same. The incident was spotted quickly by the social media gimmicks and the reactions poured in on the incident. While some were disappointed with Jasprit Bumrah’s conduct, few felt that the Indian players need moral education. However, there were a few who also defended the cricketer. Really we love you alot no doubt. I think bumrah ne dekha nahi hoga that the man was initiating a handshake. Agar usne dekha aur fir b ignore kia to it's very bad. Did you people notice That man wanted hand shake but Bumrah ignored him. 😔😔😔 Bad manner. Wen u gain publicity u have to be extra careful…Don't dishearten ur fans. @Jaspritbumrah93 Many have fallen after flying little high. Never seen this with Dhoni or Sachin. Shame on you.